Drafts of our final projects are due this week but unfortunately my project is facing serious difficulties. 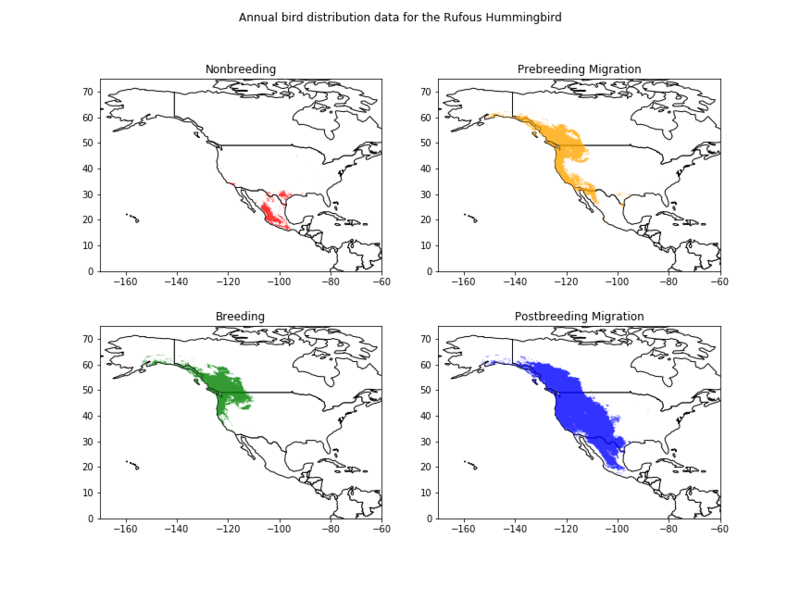 The general idea of what I proposed in last week's post to remap bird migration patterns is terrible. The dataset that I thought existed doesn't exist at all, and even if it did, doing that re-mapping would be complete garbage. For a lot of reasons. When birds migrate they fly within large territories but choose specific flight paths that follow the guidance of the earth's magnetic field and the sun and stars but also adapt to changing wind patterns, weather, and food availability. Trying to force birds to follow a specific route is insanity and if it could be done it would kill lots of birds. That being said, this is a critical design project and I want to design something that can help birds avoid dangerous light polluted areas. I do have a reasonable idea for how to do that. Birds can have geolocators placed on their backs which are used to track the migration patterns of specific birds. The geolocators are about the size of a nickel and weigh a few grams. I found an article by the Cornell Lab of Ornithology that shows how this is done. This small device can record the bird's position and save the data for later study. Since the device is able to identify its location, it should be able to identify if it is approaching a hazardous area. It could then generate a small magnetic field that is slightly different from magnetic north, nudging the bird in a slightly different direction, guiding it around the hazardous area. Alternatively, it could pick up on radio signal from the ground that identifies a hazardous area. The device could react to a nearby radio signal and guide the bird in a different direction. It's not the worst idea. Recall that we already make an effort to design highways to accommodate migrating terrestrial animals. We should be doing something similar for birds. And there was an organization called Operation Migration that attempted to teach cranes how to migrate. This isn't crazier than that project, and they had the support of the National Wildlife Federation and the U.S. Dept. Of The Interior for a while. With that, I need to identify the dangerous areas and the species birds that are in the most danger. I don't have bird migration paths but I do have data showing the distribution of bird species at different times of the year. The Cornell Lab of Ornithology has data available for over 100 birds. Here's a link for data for the Rufous Hummingbird. The data is available for download. Plotting this is easy with the Python Geopandas library. 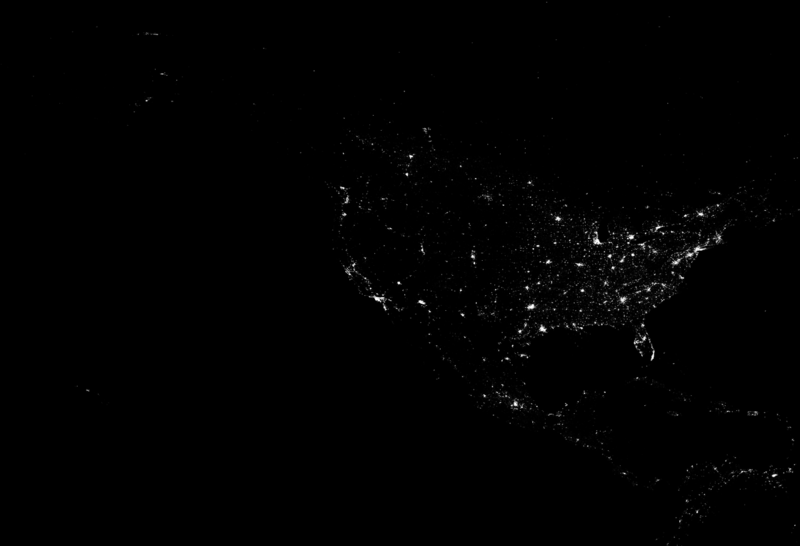 I can obtain light pollution data from NOAA. And I can plot the two together. The colors are weird but let's take a moment and rejoice that I can properly plot the two of them together. It's not easy, believe me. Fixing the colors is easy. What next? I can easily do this for all 107 birds the Cornell Lab of Ornithology offers this data for, and I can identify the birds that overlap the most light polluted areas. I can plot the data in nicer looking charts to show people the relationship between the two. My big question is how to go from this to something that is "critical design". How can I package this in a way that gets environmentally conscious people to care? Clearly, I have a lot more work to do.